I've not yet been to Thailand. But without a passport, malaria shots, or a plane ticket, I can indulge in the splendors of its cuisine by just taking a quick hop on the 22 Freeway to the city of Garden Grove. Those in Orange County who know and appreciate good Thai food have undoubtedly taken this pilgrimage themselves. I'm talking, of course, about the venerable Thai Nakorn. It's been called the best Thai restaurant in Orange County for a reason. The reason? 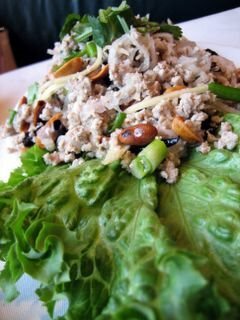 IT IS THE BEST THAI RESTAURANT IN ORANGE COUNTY! Of course, I'm biased, since it has always been one of my favorite restaurants for at least a decade. But whether you believe this post or my previous two posts on it, one thing is certain; if you haven't tried it, you must. Fried Pomfret Fish with Chili, Garlic & Sauce ($11.95) was just that -- a whole white pomfret, a salt-water fish with a milky white and delectable flesh, was gutted, scored, and fried in hot oil until blistered brown and crisp. It was served with a dark red sauce so thick it looked like congealing blood in a bowl. Tamarind pulp gave this saucy condiment its alarming color and consistency as well as its tart and fruity base flavor. Bold and chunky, it was chock full of sliced chili pepper pods, onion, garlic, and cilantro, folded into it as if a molten lava flow rolled through a vegetable garden. The next dish was as addictive as it was lethal. Since it was called Crispy Catfish with Mango Salad ($7.95), when we saw the mound of shredded young mango, red onion, and chili, one of us remarked, "Where's the catfish?" in a comical "Where's the beef?" moment. Indeed, nothing shaped like a fish was to be found anywhere in the dish. Not a head, a fin, or even a tail. Instead, dotting the salad were these golden brown crunchy crumbles that looked like Grape Nuts cereal. This, it turns out, *was* the catfish. Little morsels of it, were strewn about the dish, functioning like fish flavored croutons. And boy was it good! Who needs to bother with bones when it's all right here in these little granules. A dressing of lime juice, nuclear chili, sugar, and pungent fish sauce laced each wispy spoonful of the stuff, its flavors bright and intense. This was a dish that was hard for me to stop eating, even as my brow became soaked with sweat and my burning lips begged for mercy. I yielded only after each and every last crumb was gone. Pork salad anyone? That's what Nam Sod ($6.50) really is. Ground pork meat was cooked and tossed with julienned ginger, roasted peanuts, scallions, whole dried chilis, and sauced with lime juice. Refreshing and breathtakingly simple, this salad played very well with rice. The bite of ginger cleared our nasal passages while the lime cleansed our palates for the next mouthful. 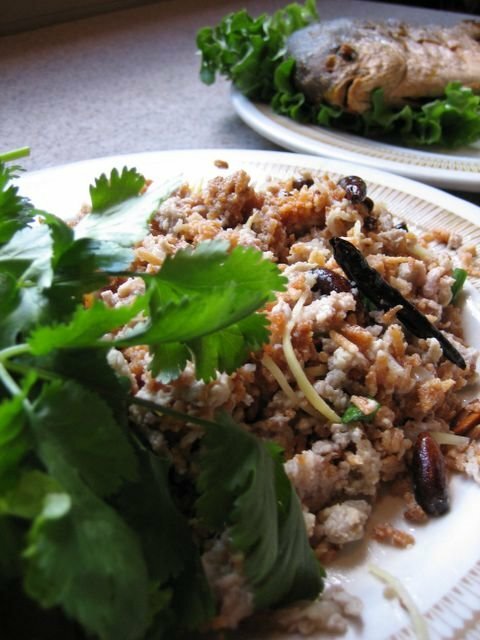 Nam Sod can also be had with Crispy Rice, house-made Rice Krispies, which added an extra dimension of texture. Snap, Crackle and Pop never had it so good. Pad Thai ($6.50) at Thai Nakorn was a serviceable dish and tasted like it should. 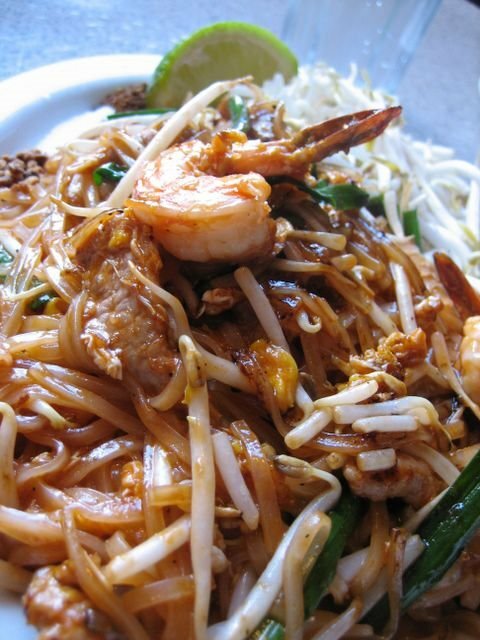 It's probably just as good as Pad Thai cooked anywhere else, but never is it this saucy and bold. A spoonful of sugar and pepper flakes straddled the plate; a practice usually seen at authentic Thai joints like this one. Bulbous and sweet shrimp surfed on top of the cresting noodle wave, its tails still attached. Fresh and crunchy bean sprouts finished the dish -- the spaghetti and meat sauce of South East Asia. 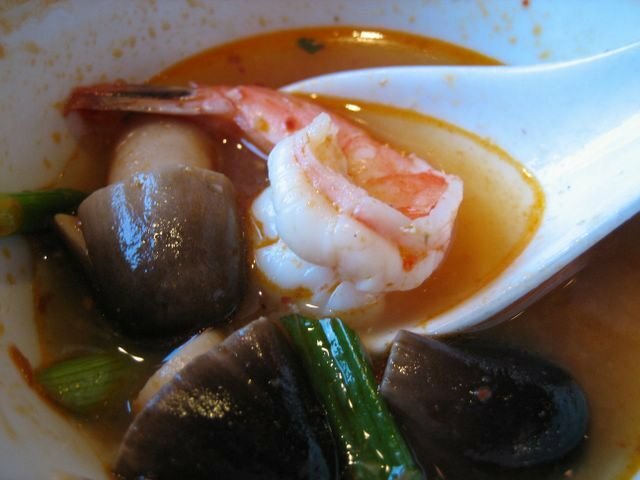 Two soups we never pass up ordering are Tom Yum Kah Gai ($7.25) and the Tom Yum Kung ($8.25). Tom Yum Kah Gai was the milder of the two, but not by much. 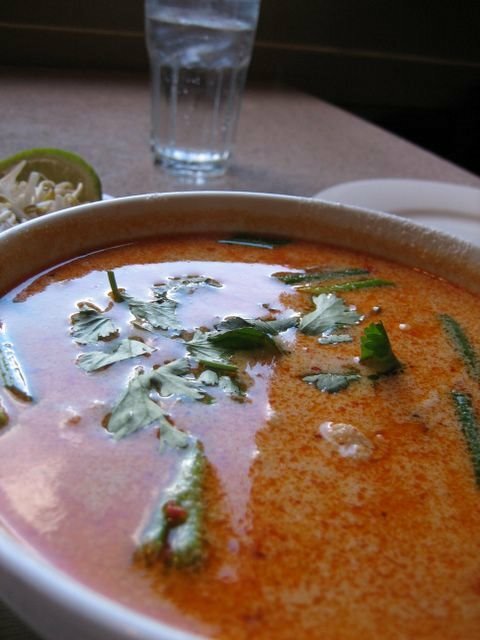 The level of heat, no matter how hot, was tempered by a good dousing of creamy coconut milk. And the spicy brew went on stealth mode because of it. The first sip entranced our tongues with the tartness of lime, the sugar, and the distinctly herby touch of galangal and lemongrass which hid behind a silky screen of sultry coconut milk. On the second sip, the raucous heat of Thai chili began to hit. By the third, a numbing sensation crept in, letting us know that soon we'd feel the onslaught of a full-on capsaicin attack. Protein, in the form of heady chunks of chicken, helped to sop up the chili pepper burn. The button mushrooms also made for a good meaty chew -- a cooling foil to the soup. 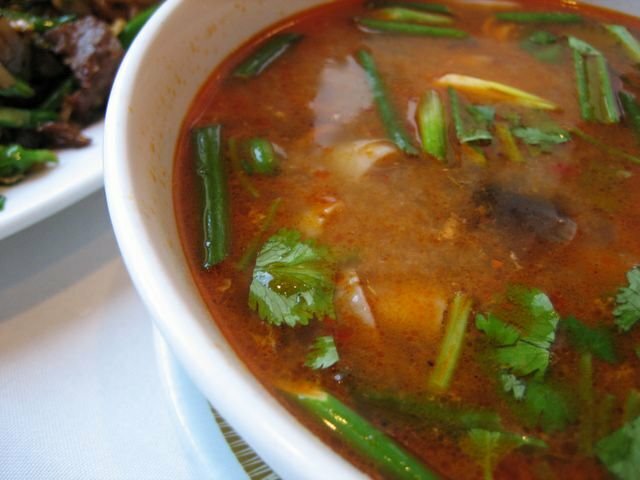 Tom Yum Kung, on the other hand, was in our faces from the very start. Not being held back by coconut milk made the broth uncensored, naked, and naughty. Diced Thai chilis floated along the top of the red soup; raw and looking for trouble. It was a foolhardy thing we did to not specify "mild" when we ordered. Now we were going to pay the price. Sure enough, the first spoonful sent us wincing in pain. "Oh my freakin' gawd," one of us yelped, vainly fanning his tongue with two hands. This was not a soup for wussies -- and I was a wuss. Defeated by the mighty soup, I meekly took the shrimp and button mushrooms out of my soup and ate them with some rice. Those with lead-lined stomachs can probably stand this liquid litmus test for chili-heads. Everyone else should probably remember to ask for leniency when ordering. To quell the fire burning in our throats we ordered Coconut Ice Cream, which did the job, though not before inducing a stifling brain freeze on our first taste. Made from coconut cream, this was one of Thai Nakorn's house creations -- a welcome respite from the dishes that came before -- both rich and icy, topped with crunchy roasted peanuts and slippery lobes of white jelly. With our palates exhausted from the workout and our bellies full of food, we bid farewell to Thai Nakorn. I would return less than two weeks later. *UPDATE (January 8, 2007): Thai Nakorn has been destroyed by an early morning fire. Read the OC Register story here. I so miss eating at Thai Nakorn! I'm really glad it's up and running at the Garden Grove location. I have fond memories of Thai Nakorn coz it's one of the first restos me and my family ate at when we first immigrated to Orange County. Do they sell their snacks on the side like they did at their defunct Buena Park location? Do they also have a karaoke corner as well? They do still sell the snacks seen at the Buena Park location, but it seems the variety is smaller than I remember. But the karaoke, I'm not sure they kept...there's a separate back room with a full bar that I rarely get seated at, so perhaps they hid it back there. I try my best. Hope to read more from you when you get a chance to write! Hey Elmo - I really need to put Thai Nakorn on my "to eat" list. So maybe I won't need to go to LA for a "good Thai" anymore. It's definitely less of a schlep than Thai Town from us "Southies". I'll even be bold and suggest that it might even beat out those LA Thai Restaurants too! For the first time, I actually think I'm going to have to disagree with you Elmo. Grape Nuts catfish niblets?!? I have to have at least chewable protein substance in my dish. 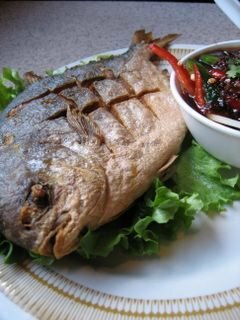 Do you think it would taste better with larger, more substantive filets of fish, or does the spicy sauce better permeate those little meat kernels? Instead of "Where's the beef," I'm saying, "Show me the money pieces of fish!" You are so mean! Incredibly mean! You brought back a huge wave of memories from my trip to Thai Nakorn with J. last year. What a fantastic dinner we had. Simply the best Thai food I have ever had. I am so envious. Ooooh. Everything is droolworthy...never thought I would have a sudden craving for savory grapenuts, lol! We have a good number of Thai places in Hawaii - but the menus are suspiciously lacking in many of the dishes you had! Since we gazed longingly at a whole grilled catfish being served at another table, I can't lie and say that we weren't initially disappointed. It's like you're expecting to meet Julia Roberts, but instead, Julia Sweeney shows up. But then, you find Ms. Sweeney is a funny, engaging, down-to-earth, and charming character all her own. Soon you forget all about Julia Roberts and figure she would've been too high maintenance anyway. Still, I think Thai Nakorn should consider changing the name of that dish to something more appropriate to what it actually is (especially figuring that it's half the price of the grilled catfish dish). I suggest "Mango Salad with Crispy Catfish Crumbles"...although it lacks a certain "Je ne sais quoi" it'll save a lot of people from some disappointment -- if only until they realize that the dish is as good as Julia Sweeney is funny. You know what? I read your old Thai Nakorn post right after I wrote this latest one and discovered that we almost ordered the exact same dishes! (The satay photo I pushed back to the old Thai Nakorn review I had). Thai Nakorn has a regional specialties menu on the first page -- cuisine indigenous from where the cooks in the back are from. Eclectic items like Wild Boar Curry and other non-run-of-the-mill items abound. I am sorry I didn't order the Stir Fried Morning Glory dish from that menu this time. Delicious! I went on memorial day - not ever doing that again. It was so packed and not to mention the parking. The deep fried fish with that red sauce is so so so GOOoooOood. Now the Nam Sod, I wasn't into much because it taste like the vietnamese Nam that has been stirred fried. I'll try the other specialty next time. P.S the rice was actually good. Wow! Looks absolutely delicious! I love Thai (on mild heat though). Maybe I'll try this place this weekend when I'm down in the OC. Thanks for the heads up. Great post, as always! Yeah that place rocks. I live in LA but I think it's better than the places in Hollywood (I'm Thai btw if that counts for anything). My favorite is the calamari stuffed with ground pork and fried in a garlic pepper sauce. Man I'm dreaming about it as we speak. I never get a chance to go down there though- haven't been since they changed locations. But the pics you have show a marked improvement over the decor (if you can call it that) of the old place! There's also the Stir Fried Morning Glory, the Deep Fried Fish with Mango Salad (a boneless deep fried fish tail), the Chicken Curry...too many to name. I think next trip, I'm going to try the more exotic stuff I've been convieniently avoiding...like the Wild Boar Curry and such. Nah, no real need for malaria shots if you're just visiting the cities or resorts of Thailand. There's no risk there. I heard it's probably a good idea if you're visiting more rural areas but you can do without it there too (very low risk)...as long as you don't get bitten by a mosquito carrying malaria! HA! I hope you like it! Thai Nakorn is OC's little gem. And yes, be sure to specify "mild" heat, because they don't seem to tone it down until you ask. Calamari stuffed with pork eh? I'm going to have to check that out! Thanks! For a big party this place is farely inexpensive. I saw your list of eating join and I am impress. Surprised that you would know Cafe Hiro. Been eating at Thai Nakorn since 1986 when they first open. Would like to recommend a couple of different dish for you to try next time. Kang som Paed sa ( Fish with tamarind sauce) extremely spicy. Thanks for the list of other things to try! I'm always looking for new items to try on their menu. I usually get at least one thing that I haven't tried before when I dine out there. The stir fried morning glory is one of my all time faves though...I get it almost every time I go...I forget why I didn't get it on this trip. Oh well. Next time. Definitely one of those places you simply must try, especially if you close by! Parking is very limited but this place is big. This is probably the best in LA. Yep...I love Ocean Star too. Been there lots of times. Just didn't have a camera those times. Perhaps soon I will return and take pictures and do a proper review. 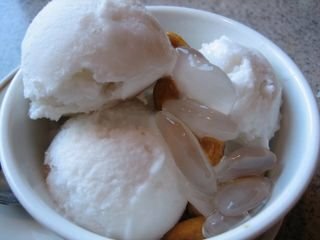 The coconut ice cream looks to be topped with palm seeds, a chewy, almost-translucent fruit which can be found canned in syrup at most asian markets. AHH! Thank you! Palm seeds! That's what it was. I knew it was a natural product but couldn't figure it out. Try their Catfish Grill for main course ( 3-4 persons ). VN Egg rolls and Bo Tai chanh are good appetizers. Have you try the Sushi Bar next to Cafe Hiro. It used to be pretty good but now it is run by a Korean family. It is not the same. Try Sushi Kura on Fairview/Wilson in Costa Mesa. It is on expensive side but very fresh fish and it has Live Uni. Tomorrow I am going to try Sushi Gen in LA that your fellow blogger Kirk raved about. I think it will be fun. Their Dimsum is very different than any where else. prepare to wait for an hour for your table. This is the BEST dunpling house in California. Do not order to take home because it is NOT good. Just came back from Jasmine Thai Rest. in Little SG. Very disappointed. Terrible food. Please destroy my post about you should try this restaurant. No more than a fast food joint. Every thing was terrible tonight. Soft shell crab with spicy sauce came out within 3 minutes after I order. It was precook and threw in fryer for quick heat and pull out. Beef salad was too salty and too much grounded rice. Morning glory was terrible. Penang curry with chicken does not have any taste. It seems like they just put the chicken in before I arrive. Pad Thai was just average. Needless to say that it will be my last time there. I have been to Favori, Sea Harbour, and Din Tai Fung. Although the last time I was at Favori (I did try the baked catfish) was before I got into this food blogging thing. Might have to go back soon. I like their French side of the menu better than the VN side. The Rosemead Sea Harbour I've tried before I blogged, but loved it. 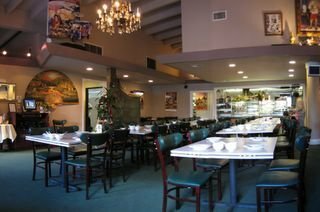 I've been to the Rowland Heights Sea Harbour before it broke off and became Happy Harbour and reviewed it here. And I love Din Tai Fung. Although the wait it unbearable. I also like Mei Long Village which I think is just as good. But with no lines. I've got a review I've been putting off for the latter. Might have to write it soon. Haven't tried that sushi place next to Cafe Hiro, but I heard there's an all-you-can-eat sushi somewhere in Cypress that's very good. Thanks for letting me know about Jasmine Thai. Just means I'll come back to Thai Nakorn whenever I'm in the mood for more Thai food. Just came back from Sushi Gen. 30 minutes wait for Sushi bar but it was worth it. This is definitely a keeper. We will be there again next Saturday with 3 kids in tow. ( Kids is relative because my daughter just finish her BS). Had a plate of Sashimi with Mirugai,Toro,Hamachi,Halibut, and Aji. 3 special hand rolls each of Toro with pickled radish, Mountain Yam with Jp basil ? leave ( very light and refreshing), and last but not least Cold Fish Eggs roll. One order of Sashimi Halibut Wing? . This is excellent. 3 large Sapporo beer. Toyo is the main chef. Kind of stuck up. Passa San ? next to him do all the work. Next time I will definitely seat with this kid. I like chef who is personal. Toyo is definitely NOT. 2 hispanic chefs in the back ground can speak broken Japanese ( Miguel and Pedro) definitely very efficient. They even notice that I was out of beer and tell the waitress to get me one. I like that. Sorry no pictures. I am NOT as good as you and Kirk. Thank you Kirk for a good recommendation. Tommorow morning is Dim Sum at Russell's seafood in Irvine. Will report on that. On a scale of 10, I will rate this an 8. All you can eat Sushi would be Shogun Sushi on Knott and Katella across from Target. I can not tell you about this place because I have not eaten there. I forgot I had Ankimo last night too with Ponzu sauce and onion. It was delicious. It was prepare by the 2 hispanic chef in the back ground. I finally had a chance to check this place out today. Of the five things I tried, the standout dish was the beef with green chili and basil. Very spicy but deeelish. The crab egg rolls were tasty, too. I'm so glad I learned about this place! Next time, I'm getting the pomfret fish and the stuffed squid. Wow! You sure get around! Have you thought about blogging your exploits? Sounds like you've got a lot of experience eating in and around OC. BTW, I've been wanting to try Russell's...and it's been a while since I've had dim sum. Glad to hear you liked it! Hey thanks for reporting back! Glad you liked it. I'm putting Beef with Green Chili and Basil on my list, along with Crab Roll. A friend said once that he can put a finger randomly on the menu and said that he was sure it was going to be good. He's probably right. Last night, I went to Thai Nakorn and had another great meal for under 80.00 (79.87). We had Morning Glory with garlic, Cha Ca ( fish paste deep fried), BBQ beef tongue ( you should try this on a Friday because for some reason it is fresher and more juicy), Seafood fried rice, Fillet deep fried fish with mango sauce, Clam with Basil leaves and last but not least is Beef salad with a side of cabbage. As usual, the food is very good. The clam is pretty good size and very fresh. This weekend , I actually will cook bun Rieu Oc at home to host my wife's friend from high school in VN. Wish me luck. I like that Stir Fried Morning Glory too....good stuff! Good luck on the bun rieu oc making! Try the BBQ Catfish and the Beef Panang, they're spectacular! Thai Nakorn in Mission Viejo. Now it is named "Glass Door" Thai. It appears that the same people still own it/work there snce the last time we visited. The dining area is pretty, well lit & inviting. But...the prices have crept up a little, & the quality seems to have slipped. Nam Sod w/ crispy rice (my former all time fave at this place) came out too greasy, and the Tom Ka Khai is now more towards the citrus-y side of flavor than the coconutt-y side it used to be on. Plus service was uneven & slow. They could use one more waitperson working during dinner hours. Still "good", but not "great" as it once was. Interesting! I had heard that that Thai Nakorn is owned (or was owned) by a relative of the owners of the Garden Grove branch...but then that relative sold it. Perhaps the original Thai Nakorn owners requested that they change their name. I wonder if the Garden Grove branch still alludes to the MV branch in the menu. The MV store was owned by Sab's sister. 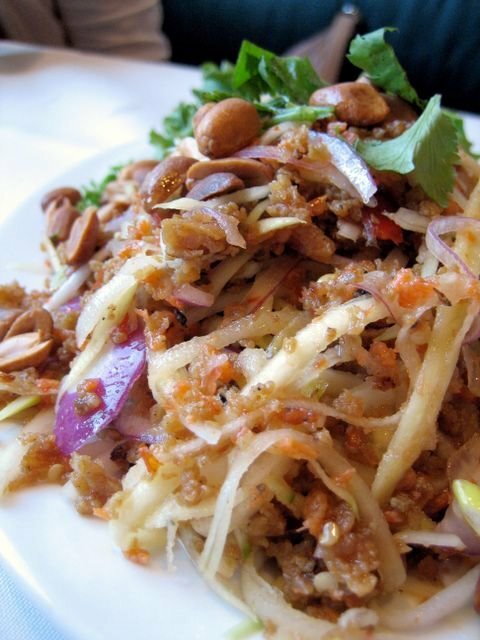 Sab is Thai Nakorn, as we know and love it. Whether it was sold or not, maybe they made it change names so that nobody would eat there and think it was anything like the Garden Grove restaurant. Is Sab = Sam = the guy losing his hair with copious facial hair and an irrepressable smile? The soups are good and the Pad Thai is excellent. But the fried pomfret fish was a big disappointment. It smelled strongly of old fish even after being fried, which means it was not fresh at all. Another indication of unfreshness was the white flesh. It wasn't flakey like fresh fish. It disintegrated at the touch of our chopsticks. I don't recommend it even though it looks good. A sad day this is for Thai food lovers. Thai Nakorn has burned down to the ground. It happened early this monring (Jan. 8, 2007). Hope they will recover and be better than ever. Take a look at the news story I've linked at the end of the article. There is a Thai Nakorn in Mission Viejo. I don't know if it's related, but it may be a glimmer of hope...for those willing to travel to south county. I may have spoke too soon. I went by the restaurant in Mission Viejo with the "Thai Nakorn" sign on the building to pick up a take out menu, only to find that the name of the restaurant on the menu is "The Glass Door". What's up with that? Still, I hope to try it as Thai is slim pickings around here. thai nakorn is no more..
Thai Nakorn will be missed!!! !Hope they plan to rebuild SOON!!!! I was incredible sad to hear it was gone. It sounds like there are plans to rebuild though. I'll just leave the link to another blog that commented on the rebuilding. if you don't want to link though, the short story is that because it will take longer then 3 months to rebuild, they are looking for a new location in Westminister or Garden Grove. Thanks everyone for the updates! I heard about the reopening this weekend. I'm going to go! Thought you might want to know that the risen-from-the-ashes Garden Grove location of Thai Nakorn is now open! We had lunch there this afternoon (Sunday). The waitress who knows my family from years of dining at the Buena Park/Garden Grove/Stanton locations said that they opened on Saturday. It seems like they have more seating for the main restaurant. They still have a private room but today that room was being used for a photo or video shoot of certain menu items (we saw their specialty "Pla Dad Deaw" on some computer monitors in the room). The best thing I can say is everything we ordered tasted the same as at any previous location of Thai Nakorn (we ordered pla dad deaw, nuah dad deaw, rad na talay, and water spinach)! They only had about 20 people including us at 1pm but I expect that to grow as word gets out (that's where you come in!) Hope to see your writeup on your blog or in OC Weekly soon! That's wonderful news! I hope you don't mind, but I'm going to quote you on a post that I'm writing right now on Stick a Fork In It updating everyone on this exciting news! Now OC has two Thai Nakorns! Wonderful!